I confess to not being a "perfect Wagnerite" but rather someone who listens to orchestral excerpts from his operas a lot more than the operas themselves. In other words, I love Wagner in small doses. That, I imagine, is something that I have in common with many other listeners. No wonder, then, that in the LP era and beyond, there has been a proliferation of discs containing such orchestral excerpts. 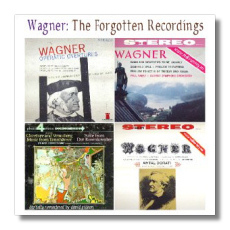 ReDiscovery has titled the present compilation "Wagner: The Forgotten Recordings," even though most of the performers are not forgotten at all. However, for one reason or another, these performances have not been preserved on CD until now. In the case of Paray and Doráti, it's just that two Mercury Living Presence LPs worth of material did not quite fit on one CD, so Paray's Parsifal and Doráti's Tannhäuser didn't make the cut. That has been rectified here. In the case of the Symphony of the Air, that was the name given to the NBC Symphony Orchestra following Toscanini's death. The orchestra made a couple of conductor-less recordings after he died, including this Meistersinger overture. As for Vittorio Gui, here was a conductor who was known primarily for his work in Italian opera houses (including a Parsifal with Maria Callas as Kundry), but he recorded a number of classical warhorses at the start of the stereo era. These appeared on several cheap LP labels, geared mostly to casual buyers – probably those with new electronics to show off – and so the recordings were suspiciously sniffed at as stereo versions by more "important" conductors later appeared. Gui's recordings appeared on labels with names such as Livingston and Camelot, and I've also seen these three Wagner overtures on the Hallmark, label pressed on red vinyl. Sic transit gloria mundi! Massimo Freccia made a blistering Symphonie fantastique (still available on Chesky) that appeared in the Reader's Digest series of LPs. Otto Gerdes was an A&R man at Deutsche Grammophon who conducted a very few recordings of his own. Erich Leinsdorf, after his RCA Victor/Boston Symphony Orchestra days, bounced around a lot and made a few LPs for London/Decca's "Phase 4" series, including the Tannhäuser excerpts found here. Leopold Ludwig's recordings also ended up in weird places, such as in the "Funk & Wagnalls Family Library of Great Music" (what does the family have to do with it?) and on the Royale label, yet he also recorded for major labels. According to ReDiscovery's very brief annotations (printed on the back of the inlay card), these excerpts from the Hamburg State Opera were made for the founder of the famous (or infamous) "101 Strings" recordings. Anyway… this could turn out to be one of the most enjoyable Wagner compilations in anyone's collection. Without exception, the interpretations are splashy and enthusiastic, and the playing (or choral work) itself ranges from good (Freccia's Rienzi, Gui's three excerpts) to superb (almost everything else). Some might consider it a drawback that the Meistersinger overture is duplicated (Symphony of the Air and Gui) and that the Tannhäuser overture is triplicated (Doráti, Leinsdorf, and Gui). However, it is fun to compare, for example, different ideas about concert endings for the Meistersinger overture. (We get two extra chords from the Symphony of the Air!) Gui's Wagner seems almost to dance – a far cry from more traditional, i.e., Germanic readings. Doráti's is the most perverse, but in a fun way; I suspect that the London violinists all had to check in to a clinic for repetitive strain injuries after putting this supercharged Tannhäuser to bed. This compilation might be a chance to make your very first acquaintance with Wagner's early Symphony in C, a work that might best be described as Weber (or Schubert) on steroids. Try this one on unsuspecting friends and see if they can guess the composer! Gerdes makes a strong case for it, and my only regret as that his Rienzi and Faust overtures, the symphony's original Deutsche Grammophon's discmates, were not included here. All selections are in genuine stereo. The Doráti, Gui, Leinsdorf, and Symphony of the Air recordings come from reel tape masters, but even the other selections sound great and often spectacular, with plenty of characteristic LP warmth. On the other hand, I think I hear pitch unsteadiness in the choruses, and sonic artifacts in the Paray and some of the Gui excerpts, but these flaws are unimportant in the long run. The cost for these two CD-Rs is $25, and that includes shipping and handling. ReDiscovery CD-Rs can be purchased from their website: www.rediscovery.us.